Flat plate solar collector is a special heat exchanger that transform the radiant solar energy from the sun into heat energy. It uses the blue titanium selective absorber sheet makes absorbing volume up to 95% of available sunlight converting into usable heat for hot water production. Comparing to the vacuum tube or any other solar water heating systems, it tends to be most effective collector for residential or commercial hot water heating projects due to their simple design, low cost, and relatively easier installation. Super white 3.2mm thickness toughened glass makes over 92% solar energy can go through. It is made of 0.4mm thickness thin aluminum sheet that is coated with a highly selective blue titanium material features extremely efficient at absorbing sunlight and transforming it into usable heat. Furthermore the aluminum sheet is laser welded to the cooper riser tubes. The insulation sheathing do a great job on preventing the heat loss from the sides and back of collector, it is made of light weight fiber glass in 35-50mm thickness and 50-60Kg/m³. The 0.4-0.8mm thickness aluminum or galvanized back sheet adds to the rigidity of the collector. TP2 Cooper laser welding header and riser tubes form a harp shaped heat exchanger together so that the solar heat transfer fluid circulates in heat exchanger. The 1.5mm thickness 6063-T5 oxidation treatment aluminum frame is widely used for anti-corrosion, anti-rusting, etc. Special integral EPDM material can avoid leakage perfectly, otherwise, its service life is over 25 years. Sinoyin solar is one of professional manufacturer and supplier of high end flat plate collector in China in 2008, we are aimed to provide the hot water solution for residential & commercial use, in hospitals, factories, hotels etc. Due to the significant features of our collector of high efficiency, easy installation, clear water assurance, also our products had successfully get the certification of Solar Key-Mark, SRCC, so it had gradually became the domain product around the world solar hot water energy product, and it is widely used in domestic hot water, swimming pool heating, industrial water heating, architecture heating etc. Our flat plate solar collector is combined with several copper tubes, and there are gaps between each tube. When the sunshine heats the tube, flat collector with its flat surface can absorb the whole sunshine. Therefore, on the same area of the same sunshine conditions, the efficiency of flat collector is 6% higher than the vacuum tube, solar absorption rate up to 95%, and emissivity less than 5%. With heat-resisting material, our collector can work even in very hot environment, which temperature can be as high as 190°. Besides, our products have got the certificates of the Solar Key-Mark & SRCC. It is suitable for the flat plate solar collector system area <100m2. The hot water tank is lower than system pipeline & collector when the circulation pump stops working. The water in the collector and pipeline can be automatic to go back to the hot water tank for keeping the collector & pipeline empty, so that it can do a help on anti-freezing. Special antifreeze liquid is an anti-freezing heat conduction liquid that combined with the antiseptic and Scale inhibition. It has good performance of heat conduction and can works well under the low temperature of -40°. Take some large site, hotels and swimming pools and factories for example. When using the solar water heater, normally it needs to combine multi plates together, thus the metal parts to joint different plates together are more stable than the vacuum tube. Unlike with the vacuum tube, all the tube need to assembled one by one, and it is easy to broken, also some small accessories is easy to lose. Our flat plate collector is the whole integral part, only to need to use with quick slot to combine together, also it can be installed in flat or slope roof, no limitation of the places. The absorber plate of the flat collector is consisted of metal materials, also the collector & storage tank is connected by metal part. Therefore, it can stand the pressure from the city water supplying and circulation pump. That city water supplying mostly is the centralized water supply system and high pressure, so it is also required that hot water proceed from the collector will be of high pressure. Reducing the pressure difference between water heater outlet and tap water outlet, it provides convenient and comfortable service for the users. Flat collector is consist of the frame, back plate, insulation, absorber plate, glass cover and sealing part, and it’s not complex. As for its simple structure, our collector is very easy to process and the mass production of the flat collector can be easily realized. At the same time, it is easy to install and cost-saving. Different from vacuum tube solar collectors, the flat collector can be installed widely in some places, such as different roofs, balcony also, which can be well integrated with architecture. As for its flat structure, the collector can be easily installed, welded and fixed, so it can save time and cost. All the accessories of collectors are made from high-quality cooper material, having excellent anti-rust, anti-corrosion, and stable performance. So the service life of our flat plate solar collector is quite long, can be more than 25 years. Converting solar energy into heat energy, then transferring the sunshine passed across the low iron safety transparent glass of the collector, which heats up, and gets a great amount of the radiation from the sun. Heat into working fluid, therefore the cold working fluid from the bottom of collector is gradually heated, so that temperature is rising. Finally the heated liquid is transferred back to the top of the collector of storage tank for using. Whole process is the useful energy collection. In the meantime, due to absorber plate temperature rise, only very little of the heat emitted by the absorber escapes the cover. 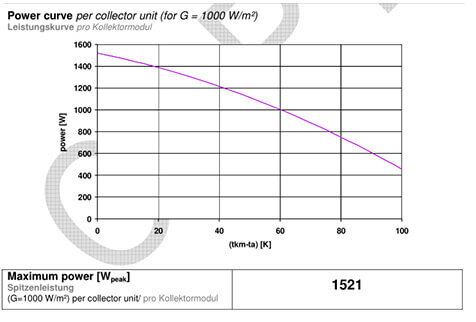 Based on Test method according to DIN EN 12975-2:2006 chapter 6.3, our FP-GV 2.15 collector had made the power of 1521. 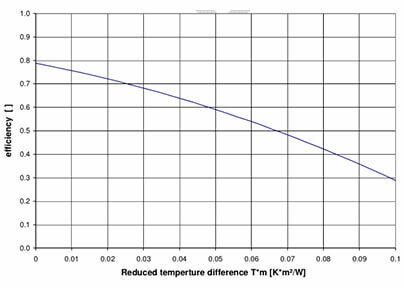 Efficiency curve presents a visible result of the working efficiency of collector that is test by solar Key-Mark EN12975-2 2006 basis. 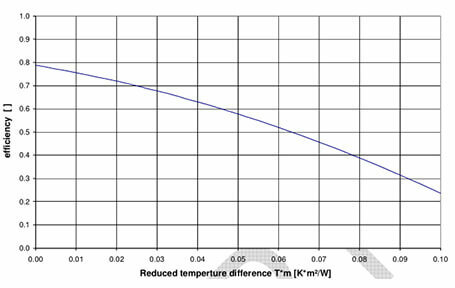 However, it is lack of sufficient evidence to show that the real working efficiency of the collector, since it will differ from different conditions, like the environment temperature, the installation angle, the working conditions etc., therefore another three different surface areas that may be used to define the size of a thermal solar collector: Gross, Aperture & Absorber. It is measured by the total width*height of the collector. This kind of measure including the outside frame, absorber coating part, it is considered to be the good way to judge the flat plate collector is worse to install on the roof. ● Flat plate collector is depends on the area of the cover (glass) absorbers from the sunlight. ● Evacuated Tube Collectors: Calculated as the inner diameter of the clear glass tube. Aperture has been adopted by most countries and industry associations as the standard surface area to use when quoting efficiency values. Calculated as the exposed area of the solar absorb. A flat plate collector may have a performance value of 79% based on aperture area, but because the gross area is almost the same as aperture, the gross value will only be slightly lower. So above all, test result of efficiency is based on specific conditions, it will differ between different factors, the thin air condition, as a professional manufacturer of solar collector based in China since 2008, customized full-time solutions had provided to our customer from different regions, so that our customer can make maximum utilization of the solar energy. Aluminum with magnesium is considered as the best anti-corrosion material. Avoid crack, use sealing material on the part need to be gapped, better than laser welding. Through the anodic oxidation treatment, can get 1000-3000 times better than autoxidation. 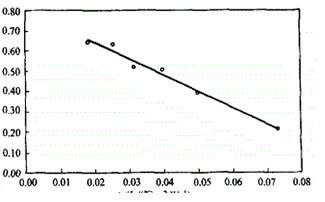 Through this methods, the absorber plate lifetime up to 10 yeas more. The flat plate collector is used with aluminum alloy frame, light weight(p=2.7g/m³），thermal conductivity(237W/m*℃),it is a whole part, no gap between the copper tube and the absorber plate, so it is enjoys high heat transfer. It is easy to install & maintained on the commercial solar water systems. Tilt angle:30°natural circulation lowest temperature：3.7°Highest temperature: 8.7°minimum solar irradiation time 421W/m2, Maximum solar irradiation time 650W/m2, maxinum wind speed 4m/s, minimum wind speed 1.5m/s. The test result is: water from 9℃ to 39.5℃, total power is 12445KJ/m2, so average efficiency on so bad environment condition up to 49.5%. Above all, as for the improvement of the design of the collector from the absorber plate, aluminum frame, special insulation part etc. can get a better performance on the flat collector working efficiency.